Videos enrich church websites in ways that text, images and audio alone aren’t able to. Churches can use videos to introduce their pastors, share member testimonies and promote events on their websites. Putting a video on a web page, however, is more involved than posting text or uploading a picture If your church wants to enhance its website with multimedia videos, here is an overview of the available options–and why your church should probably use a video-hosting service like YouTube or Vimeo. Videos may either be hosted or embedded on websites. Videos that are hosted locally are uploaded directly to a site and streamed from the site’s server. Videos that are embedded on a site are first uploaded to a video-streaming service, such as YouTube or Vimeo, and then they’re embedded onto the site using a short snippet of code. Visitors can still watch the videos without leaving the website, but the video files are stored and played from a third-party’s servers. The vast majority of churches choose to embed their videos for one simple reason. Hosting videos is more complex than embedding them. If your church doesn’t convert its hosted videos to each of the three formats, some visitors may not be able to watch the videos on your church’s site. Second, each format of each video will need to be converted into a HD-quality video and a standard-quality video. Site visitors with fast connections and large computer screens will want crisp, HD-like videos. To provide this level of quality, your church will need a 720p or 1080p file that streams at a high bit rate. Visitors using mobile devices will need smaller files that stream at lower rates, so they don’t have long waits while videos load or buffer. Thus, your church will need a total of six copies of each video it wants to host on its site. It will need an HD-quality MP4, WebM and Ogg version of each video, and a standard-quality copy in each format. Should your church elect to embed videos, it will only need to upload one copy of each video. The service your church uses will take care of converting the file your church uploads. It will make six copies almost instantly, and automatically determine which version to stream when visitors come to your church’s site. All your church needs to do after uploading the video is copy the code provided onto the appropriate web page. In contrast, when embedding videos via a third-party service, the service provides the bandwidth, sharing and commenting features and organizational tools needed to manage videos. All that goes on a site itself is a short snippet of code, which does not use up a significant amount of bandwidth or present security risks. Embedding videos has a few disadvantages of its own, but most churches find these downsides pale in comparison to the disadvantages that hosting videos presents. Additionally, the drawbacks of embedding videos are overcome fairly easily. The main cause of concern for churches using embedded videos is the inability to control what’s displayed alongside videos. When a video is hosted by a third-party service, the hosting service may place advertisements or other videos around the video being watched. Churches have little control over the advertisements and no control over the videos shown. If your church uses YouTube and doesn’t post any copyrighted material, you can disable the ads YouTube runs. To find the appropriate controls, go to “Channel” and then “Advanced” in your church’s YouTube account. Should your church include any copyrighted material, even if it’s just a glimpse of a copyrighted book cover or a quote from a song, YouTube may override your church’s settings and run ads. Both YouTube and Vimeo show video suggestions that can’t be disabled. In theory, these videos may espouse views your church doesn’t support, but the risk is minimal. The suggestions are usually based on the video currently being watched and are similar to it. In addition to these main concerns, there are also minor irritations associated with embedding videos. For instance, some features (e.g. rating and commenting features) are only available on the hosting site–not in embedded players. Additionally, the hosting service’s logo or name will be visible in the embedded player. These are small considerations, though. YouTube and Vimeo offer similar services, but there are slight differences in their plans. YouTube is free and lets users upload an unlimited number of videos, but, as previously discussed, it runs advertisements to generate revenue. Vimeo is ad-free, but places restrictions on the number and size of videos users can upload. Most churches that use Vimeo need to pay the $199 annual fee for a VimeoPro account, as the service’s free account is extremely limiting. If your church wants to incorporate more videos into its website, both YouTube and Vimeo are viable solutions that make it easy to embed videos on a site. Either service is a simpler solution than locally hosting church videos. YouTube is a good, free solution for churches on a tight budget, and Vimeo is a solid choice for churches that don’t want ads run alongside their videos. Talk with your church website design team to see which they would suggest using, and sign up with either of the two hosting services. 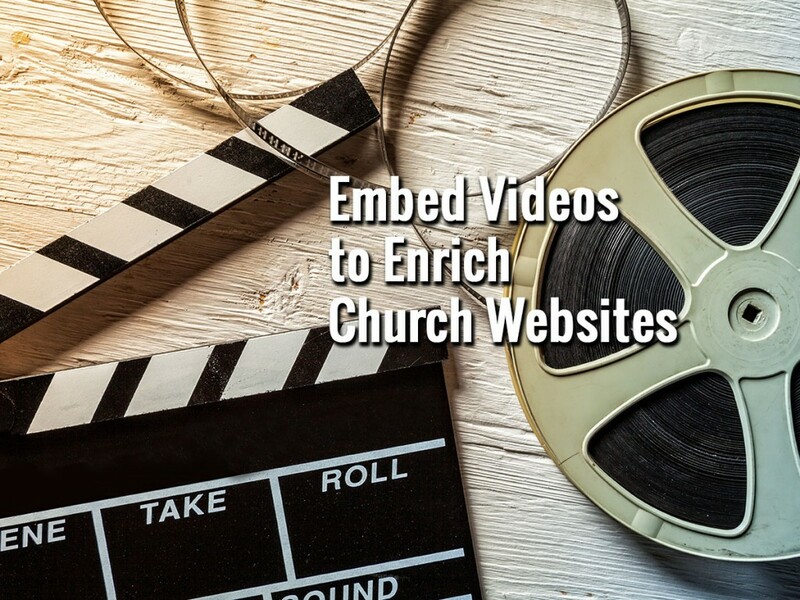 In just a few minutes, you could be making your church’s website richer and more engaging with embedded videos.